Available on all ranges of safes from size 2 upwards. 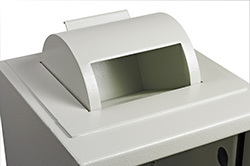 The rotary is integrated into the top of the safe and allows parcels to be deposited into the safe via the rotary drum. Other sizes on request. Coffer optional. Available on the Harlech, Dudley, Compact 5000 & Europa models. Fitted front, side or rear facing. 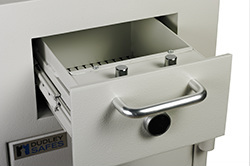 The drawer opening is 260mm wide, 250mm deep & 145mm high. Secured by key-lock as standard. 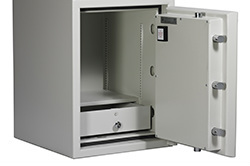 Available on all ranges of safes from size 1 upwards. 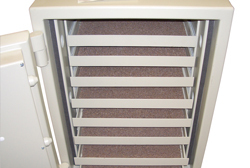 It can be positioned on the top, rear or side of the safe. 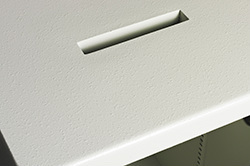 The standard opening measures 150mm x 25mm. Other sizes on request. 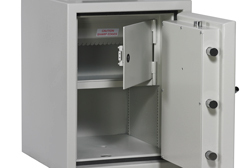 Available on all ranges of safes from size 1 upwards.The deposit hole can be positioned in the top, rear or side of the safe. 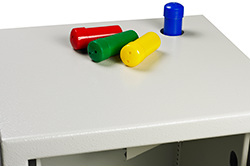 Each safe comes complete with six capsules.